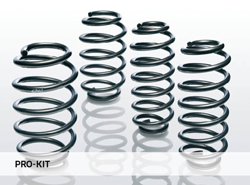 »The Will to Win« is a good way of describing Eibach's product philosophy. 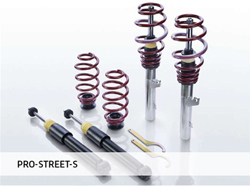 The main aspect of Eibach Suspension Components is a noticeable improvement of the driving characteristics - the basis for being a winner - brought to you directly from motorsports. The enhanced sporty look on your vehicle with Eibach high-performance products is only of secondary importance. This is where we stand out from other companies: we only lower the vehicle's centre of gravity as far as it is technically practical. You will not find extreme tuning here: at Eibach, performance and handling - therefore the joy of driving - are the priorities. 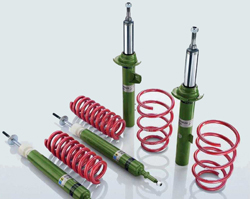 All the products are developed, manufactured and tested by Eibach. This is the only way to 100% fulfil the high demands set by both, you the customer, and the Eibach team. If you're looking for the perfect combination of sporty dynamics, a superior appearance and high performance, you're on exactly the right track with this sport suspension. Sport und comfort coming together. If you're looking for the perfect combination of sporty dynamics and a superior appearance, but still want to stay on the comfortable side, you're on exactly the right track with this suspension.